Morocco is looking likely to be the first in the North African region and the wider continent to craft rules for crowdfunding activities, both Islamic and conventional. 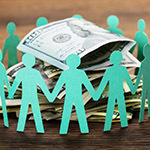 Following in the footsteps of several of its Western and Middle Eastern counterparts, Morocco’s Ministry of Finance has drafted a crowdfunding bill, the Collaborative Financing Bill (crowdfunding is colloquially known as collaborative financing). The draft document, as viewed by IFN Fintech, outlines financial and regulatory requirements for Islamic and conventional platforms and operators across three different categories of crowdfunding: equity, lending and donation. The new rules come as the Moroccan government attempts to engage the country’s youth economically and support MSMEs. “The establishment of a legal framework governing collaborative financing activities is part of the effort of public authorities to strengthen the financial inclusion of young project holders, to support economic and social development and [to facilitate] the channelling of collective savings toward new opportunities,” the ministry noted. Under the proposed rules, the central bank, Bank Al Maghrib (BAM) will supervise peer-to-peer financing and donation-based crowdfunding activities while the Moroccan Capital Market Authority (MCMA) will regulate investment and equity type crowdfunding. Approved platforms will be granted Collaborative Financing Platform Manager status and are required to join the Association of Collaborative Financing Companies. Like in most jurisdictions including in Malaysia, Morocco will cap the amount of funding allowed for each project/venture via collaborative financing platforms as a form of investor protection. The ceiling has been set at MAD5 million (US$542,202), while individual investors may only invest up to MAD250,000 (US$27,110.1) in a single project, and a maximum of MAD500,000 (US$54,220.2) for the entire calendar year irrespective of the number of campaigns supported. These restrictions do not apply to angel investors. As a measure to also encourage the participation of the Moroccan diaspora in the country’s development projects, collaborative financing opportunities are open to both resident and non-resident individuals. Also in a regional first and one of the few globally to set up a regulatory framework for Shariah compliant crowdfunding platforms, Moroccan participatory collaborative financing operators are subject to more stringent rules – apart from answering to the BAM and MCMA, Islamic platforms are required to seek approval from the Higher Council of Ulemas on their business model and operation framework, in addition to complying with with standard Shariah contracts as regulated by the BAM and MCMA. Islamic operators are also required to use Takaful insurance where needed and Shariah banking accounts. In addition to mandatory annual reports, participatory platforms need to also produce and annual report evaluating the conformity of its business to Shariah principles. Crowdfunding is the fastest-growing vertical in the Islamic fintech industry. According to the IFN Islamic Fintech Landscape, there are 30 crowdfunding platforms operating within Shariah parameters worldwide.